The Liebster Award is back again! Today I've been nominated by Courtney of PaperBack Beaches! Thank you so much Courtney! You can check out her award here. 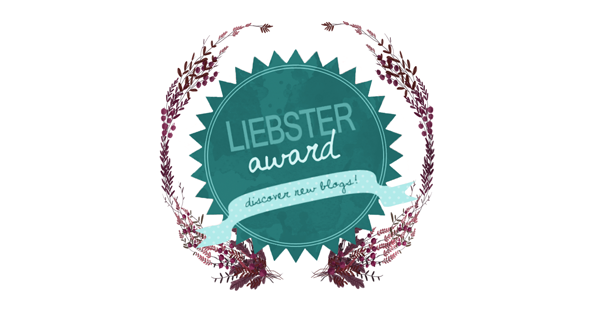 This is the 5th Liebster Award that my fellow lovely bloggers have nominated me for! You are all too sweet! Check out my other Liebster Awards here. 5. Be sure to link up with the blogger who nominated you! 1. What was the worst book you ever read or stopped reading? I am happy to say that I have never met a book I didn't like. There are a few that I kept reading for the story that the grammar almost ruined though. I guess I don't read enough non-mainstream books. 2. What kid's movie where you scared of as a child but like now? I can't really think of a kids movie that scared me. I was scared of the dementors in HP3 but who wasn't? I was never really scared my "kids" films. I never really watched "kids" stuff other than classic Scooby-Doo, Tom and Jerry, Ed Edd and Eddy, Fairly Oddparents, Rugrats and Danny Phantom. I watched a lot of "grown-up" shows. I watched Law & Order SVU with my Mom and Aunt. And I watched Back to the Future, Lost and Star Trek with my dad. 3. What quote inspires you? "Be the person you wish you had in your life when you were younger." 4. What is your least and favorite blogging post and why? It really showcases my photography that isn't product photos. It is the only post on my blog that has photos that nature photos. I'm proud of this one because it was really hard from my to write. At the time I was trying to daily upload for the entire month of April and I had to stop on day 20. I actually really loved writing and I was so happy after I did! I love this post! It felt so go to write down why I write the way I do! Do many people try to tell you that you need to have a niche or that you should stick to only a few topics. I love writing about everything and I loved writing this post! This might seem like a dumb one but I'm really proud of the photos in this post! I really love them! I love this one again for the photography. But I'm also really proud of the writing! I think I was really detailed about the brand and I am really happy with how this post turned out. I don't think I have a least favorite. I am proud of all the posts I make. 5. How do you promote your blog? Twitter mostly. I have kinda fallen off the social media train. I'm only really using twitter right now. I want to share more on Instagram, Facebook and Pinterest. I read anywhere I can, when I can. 7. What are some things you haven't seen or read, but know everything about because of popular culture? I don't know everything, but I think I know the main outline of Game of Thrones because of twitter. 8. How would someone describe your blogging style? I'd like to think it would be described as personal and passionate. I love to write about my life, my interest, my hobbies and the things I love most. 9. What do you find most challenging about blogging about your topic? Since I write about a little bit of everything each topic can be challenging in its own way. When I write beauty posts sometimes I worry if brands will take it badly, if a product isn't good I'll tell you guys no matter what. When I write a post about a character or series sometimes I worry about how the fans will take it. Fandoms don't take hate of a beloved character or love of a hated character well. When it comes to the personal stuff opening up is becoming easier and easier. I want to write more personal posts. It feels so good to be open about things! 10. What is the most ridiculous fact you know? I have an eidetic/photographic memory so I remember so many facts. The first strange fact that comes to mind is unlike other snakes vipers, rattlesnakes and boas give live birth. If you haven't see a video of it don't look it up. It's kind of freaky. 11. In 40 years, what do you think people will be nostalgic for? Classic YouTube most likely. When the 1st gen of YouTubers are retired and it's like mainstream media people will miss what it's like today. 1. What is your biggest passion right now? 2. Other than your blog how do you channel your creativity? 4. What is the craziest thing on your bucket list? Or the craziest thing you want to do in your life? 5. Do you have a secret hidden talent? 6. What do you want the first impression of your blog to be? 7. What are your favorite songs ATM? 8. What TV show are you most excited for this fall? 9. If you could start your blog all over again, would you? Would it be different? 10. If you could live anywhere in the world, where would it be & why? 11. What is something you love about yourself? Thank you so much for checking out my 5th Liebster Award! I love doing awards like this! It is such an honor when a lovely blogger nominates me and tags are always fun to do. Thanks again to Courtney for nominating me! Make sure to check her out and all of my nominees too! I want to know your answers to my questions for my nominees! Please answer them in the comments below! Photo Credit: Award background Art by me. Please feel free to use it with credit!